Education Perfect's spelling lists test students' spelling by saying a word in context and requiring them to answer with the correct spelling of that word. Spelling lists are available for all non-language subject areas, such as English, Science and Maths. The Education Perfect Content Team has already developed a number of spelling lists for you to use, but you can also make your own for automatic, self-marking spelling tests to complete in-class or at home. They are also valuable as a resource for other subject areas to improve students' spelling of domain-specific vocabulary, for example Science terminology. Open theContent Library from your Control Panel. Ensure your Content Library is in Edit mode, and switch the displayed subject to any non-language subject. Open the folder you would like to add the spelling list to, click Create an Activity and choose Spelling List. 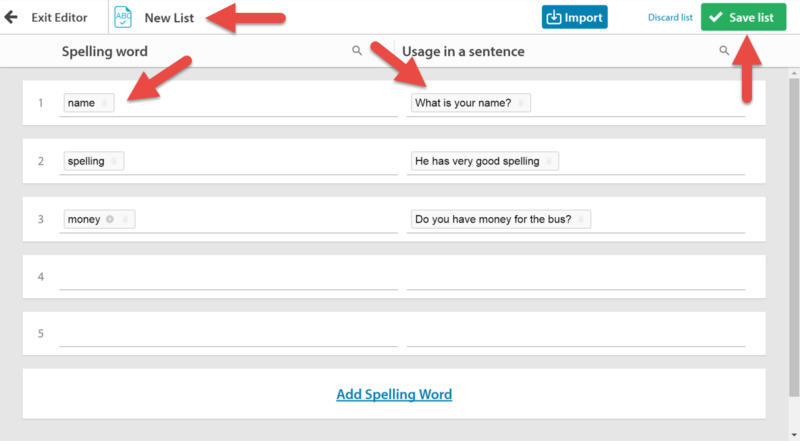 You can also right-click on the centre panel and choose Spelling List from the menu. Give your list a name by editing the title, then add words by typing the spelling word on the left and a sentence containing the word on the right. Continue to add as many words and sentences as you would like by clicking Add another spelling word, then click Save. As you add words to the list, the server will generate electronic sound files for each word and the sentence containing the word in the background. Normally these will be available shortly after you complete the list. If human voices are available, these will be used instead. Please contact content@educationperfect.com with any issues relating to electronic sound files, or spelling lists in general. You can also import a large number of questions from an existing spelling list in a spreadsheet. Create your spreadsheet in Excel, Google Docs, or any other spreadsheet tool. Put the spelling word in one column and a sentence containing that word in the column beside that word. In the list editor, click the blue Import button at the bottom of the page. Copy the data out of your spreadsheet, and paste it into the dialog box that appears. Ensure that the column headers are the right way around, then click Import. To find out how these lists are presented to students in the Student Zone, see: How do students use Spelling lists?